While we wait for the great Welsh novel in English this compelling documentary novel about Wales between the early 1970s and the demolishing referendum of 1979 helps gainfully fill the time. If there’s any murder at work in Ten Million Stars…it’s that of the dream of devolution, hatcheted to death by Labour politicians such as Leo Abse, who managed his own project fear, warning that more power given to Wales would inevitably end up in the hands of Welsh speakers. People voted against devolution four to one, sending many into the doldrums for a good while. Written by veteran journalist, TV producer and policy wonk John Osmond the novel is garnered from a range of records – from newspaper articles through official archives and first hand accounts not to mention his own clear memory of the times. And so we have a cast of real-life characters such as Abse, the libertine poet John Tripp and cultural guru Raymond Williams set amid a sprawling and entertaining cast of trade union leaders, newspapermen (with no newspaperwomen, this is the 70s), student activists and politicians of many hues. Holding the novel’s narrative together are the lives of two fictional creations, Rhiannon, a defiantly brave member of Cymdeithas yr Iaith, the Welsh Language Society and Owen James, a Western Mail journalist whose sympathies are very much with the ‘Yes’ camp. It’s a device that allows Osmond to marshal his material effectively, taking us up transmitter masts and into women’s prisons, into Westminster dining rooms and George Thomas’s sitting room. For a doorstopper of a book, weighing in at over 600 pages it’s a very easy read, made even more pleasurable from the simple knowledge that this is a chronicle of days that many of us have lived through, and these public figures have populated the theatre of our own lives. You might have to be steadfastly interested in Wales and its history to want to read it, but the novel is its own argument for the pressing need to do so. I have one minor cavil: the journalistic tendency to introduce many a character with a concertinaed version of his or her CV tends to slow things down and isn’t strictly necessary, as there’s a detailed who’s who in the back of the book. 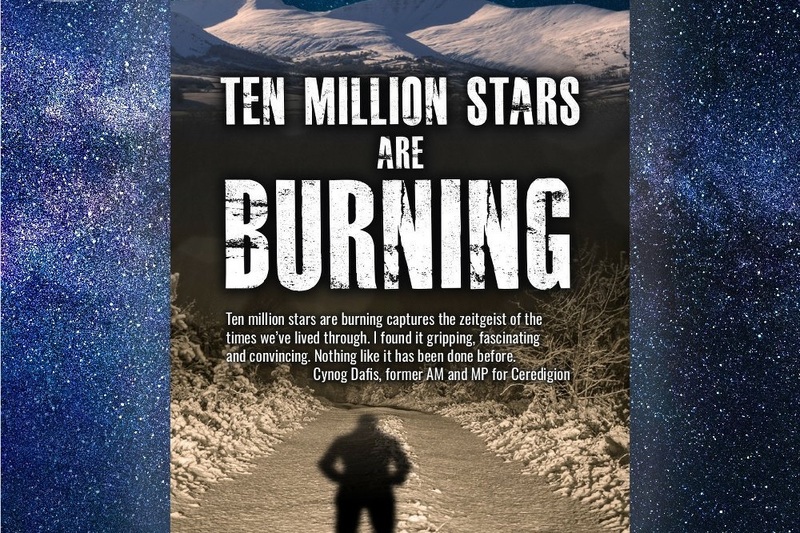 That said Ten Million Stars are Burning is merely the first part of a projected trilogy by a man who was a quiet architect of political change in Wales which led to a second referendum and the eventual creation of the National Assembly. It may be that Owen Jones is a sort of fictional alter-ego for the politically astute John Osmond, eavesdropping on the past, teasing out its significance for the future. Ten Million Stars are Burning is a significant achievement born of huge amounts of research and thought, and an important experiment in presenting (recent) history outside of the textbook and classroom. And in a country which increasingly feels under siege it’s a reminder that writers can help shape countries and steel the spirit just as much as cadres of politicians.